In Jharkhand, 39 per cent of the work demand remained unfulfilled. The enactment of the National Rural Employment Guarantee Act (NREGA) marks its 13th anniversary on February 2. The scheme has been constantly undermined and weakened by the Centre, and different state governments. In Jharkhand, the work demand was 71 lakh man days during the last financial year, and only 43 lakh man days were provided, which indicates that 39 per cent of the work demand remained unfulfilled. 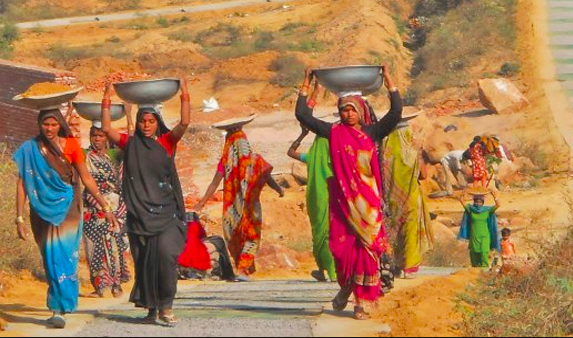 According to James Herenj and Taramani Sahu of Jharkhand NREGA Watch, the state government has deleted seven lakh job cards in the last three years. Many of these cardholders belong to the households that had done NREGA work, and were unaware that their job cards were cancelled. As per the Act, each rural household can demand up to 100 days of work. However, in the last three years in the state, each household has “got only 40 days of work on an average”. Further, the proportion of Adivasi and Dalit households in the NREGA workforce has fallen from 50 per cent to 38 per cent in the same period, according to the Jharkhand NREGA Watch. In 2015-16, the state government had conducted the Yojana Banao Abhiyan (YBA) with large-scale publicity. “The workers and Gram Panchayats had chosen about 10 lakh works to implement in their panchayats. Instead of taking these into consideration, the state government has imposed schemes of their choice on the people. Along with that they have violated the NREG Act and undermined the Panchayati Raj system by forming Adivasi and Gram Vikas samitis,” read a release by NREGA Watch. YBA was supposed to give an opportunity to newly elected gram panchayats to lead planning exercises with the support of women’s collectives and other community-based organisations. Though the Jharkhand government claims that 99 per cent of payments were made within 15 days, it is completely false since the delays are not even accounted for in nearly 50 per cent of the cases. Issues like the incorrect entry of Aadhaar and account numbers in the MIS, linking of Aadhaar to wrong bank accounts, work done with muster rolls, closing of works when there was lack of funds etc have persisted, and many workers have not been paid. “The attitude of the Jharkhand government is clearly reflected in the fact that the State Employment Guarantee Council, of which the Chief Minister is the head, has met only once in the last 4 years. There has been no action against the officials held responsible for violating the rights of the workers as per the social audit reports. And the position of the Lokpal is vacant in 19 districts. Further, 40 percent of the posts of NREGA personnel are vacant,” said the note. The state in the last two years has seen as many as 18 deaths due to starvation. It is important to note that families of these deceased have not got any NREGA work in the last few years. Without considering these facts, the state government sent a report to the Centre, saying that there was no connection between the death with NREGA. NREGA watch also demands that the state government should take immediate action to resolve the issues stated above. On the other hand, the BJP-led Centre, which always makes tall claims about the economic development, has not allocated significant funds to the NREGA scheme in its final budget which has been presented on February 1. In his interim budget presentation, the interim Finance Minister Piyush Goyal announced that Rs 60,000 crore has been allocated for NREGA for the financial year 2019-20. But the allocated amount is 1.8 per cent less than what was given in the previous financial year. In February 2018, Rs 55,000 crore had been earmarked for the NREGA in the budget, and in January 2019, an additional amount of Rs 6,084 crore had been allocated to meet the financial needs. In total, Rs, 61,084 crores had been earmarked for NREGA in the 2018-19 financial year.